New interactive digital tool will help consumers learn about process of raising pigs from start to finish. It's not every day that public audiences get to interact with pigs and the people who raise them, so to help bridge that gap, The Maschhoffs LLC announced that it recently created the Farm-to-Table Experience to explain the process of raising a pig from start to finish. The interactive digital tool was officially launched on Aug. 1, 2018, during a stakeholder event at the company's headquarters in Carlyle, Ill.
Pork producers like The Maschhoffs have been large contributors to the growth of the industry over the last 50 years, the announcement said. According to the National Pork Board, U.S. pork production has nearly doubled in that time frame while using 78% less land and 41% less water per pound of pork produced — reducing the carbon footprint by 35%. Advancements in areas like genetics, nutrition and resource management have been main contributors to this improvement. 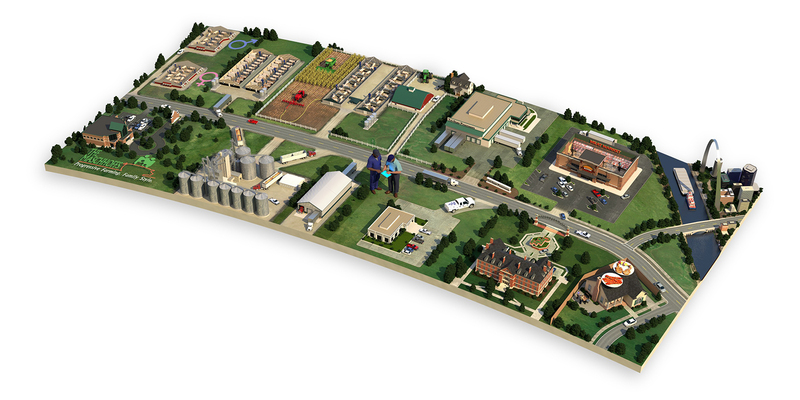 As the map shows, the “north” side of the road highlights the production process, while the “south” side of the road focuses on the functions that support raising high-quality pigs. The user can drag to different “hot spots” on the map to click and learn more. Each spot has an explanation of the area as well as corresponding pictures and captions to tell the full story. This interactive setup enables users to get as in-depth as they want to learn about the production process. To view the map and to learn more about The Maschhoffs, visit www.themaschhoffs.com/process. The Maschhoffs is a hog production company with more than 100 years of experience and is the largest family-owned hog producer network in North America, with nearly 215,000 sows and market hog production sites in nine states. The company has approximately 1,200 employees who, along with about 500 independent farm partners, focus on creating environmentally and economically sustainable hog production systems. Each year, the company raises enough hogs to provide pork to more than 16 million consumers. The Maschhoffs, through a wholly owned subsidiary, also sells branded pork products to retailers, processors and foodservice operators under the Maschhoff Family Farms brand label.